Are we stuck between Bank Holidays? 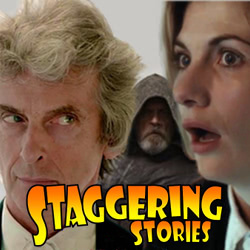 Yes, Staggering Stories Podcast 279: Last of the Jedi, Two Doctors and the Rum is now available! Plus, as ever, lots of news (Doctor Who, Dirk Gently, fan films and more). More madness than having four people credited as the same character!